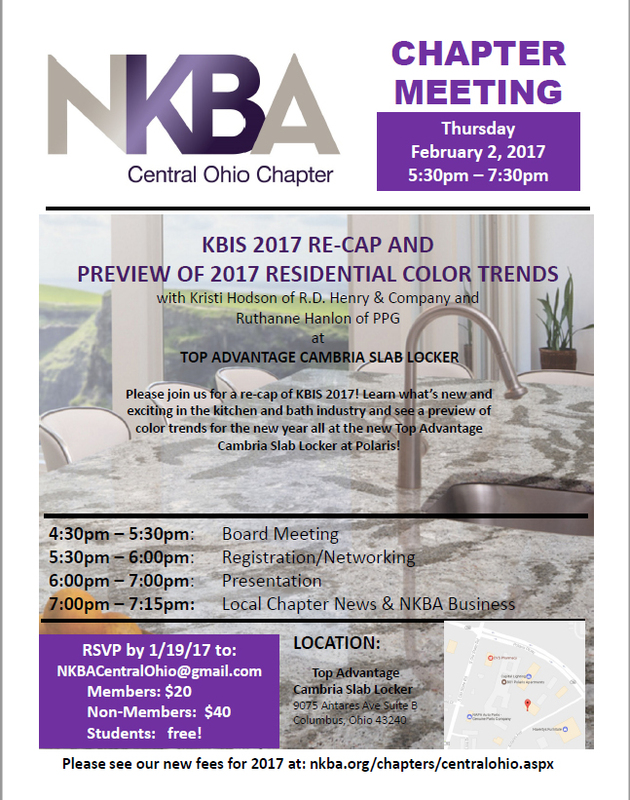 NKBA Central Ohio is the local chapter that brings together local Central Ohio Kitchen & Bath distributors, retailers, remodelers, manufacturers, fabricators, installers, designers, and other professionals – and provides a resource for local consumers to research, educate and connect with Central Ohio Kitchen and Bath professionals. 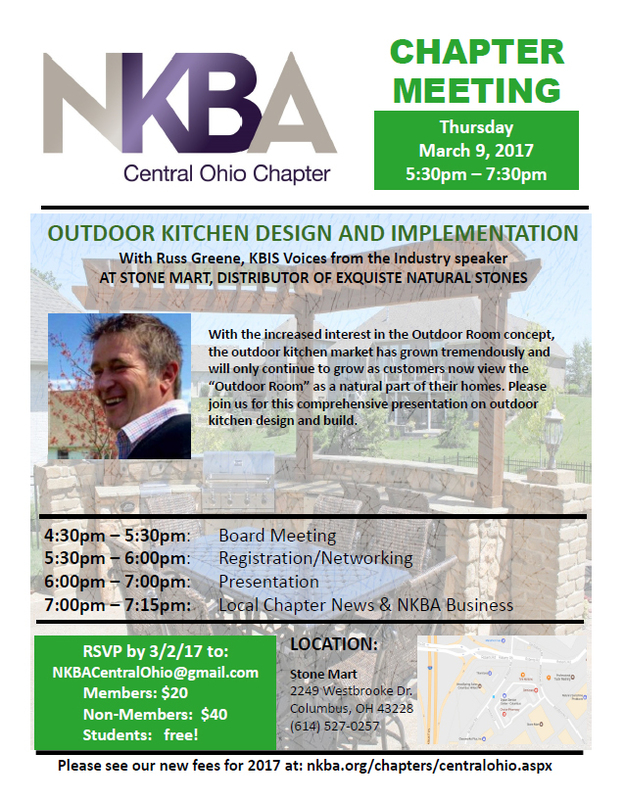 Click here to visit the NKBA Central Ohio Chapter’s Facebook page. This year, Decorators’ Show House becomes Designer Showcase (DSC) and moves into the first floor of the Walter Wing. Sixteen local designers will transform blank galleries into 18 creative living spaces, including bedrooms, living room, bath, and kitchen. 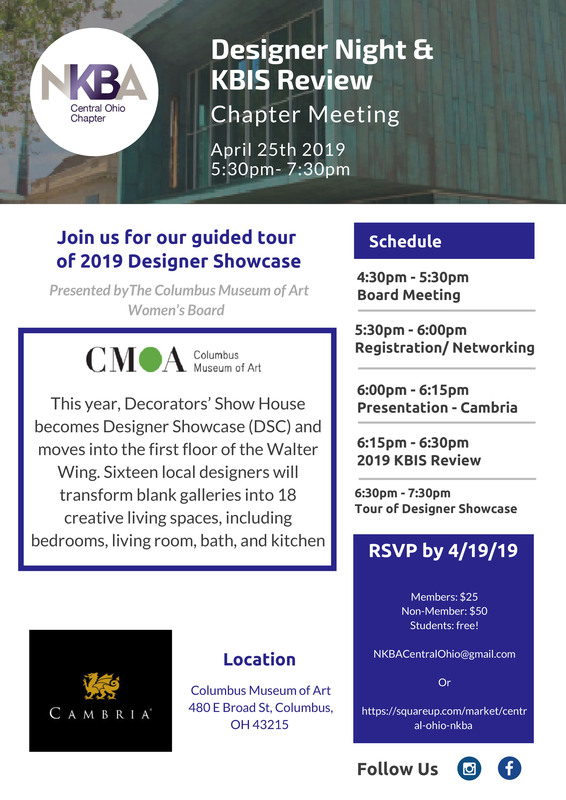 This event will be a guided tour through the designer spaces and follow with a review of KBIS 2019. Porcelain slabs are an intense trend hitting the construction market. Sleek, modern, timeless looks, plus being able to be installed over existing materials cuts down demo and installation costs! 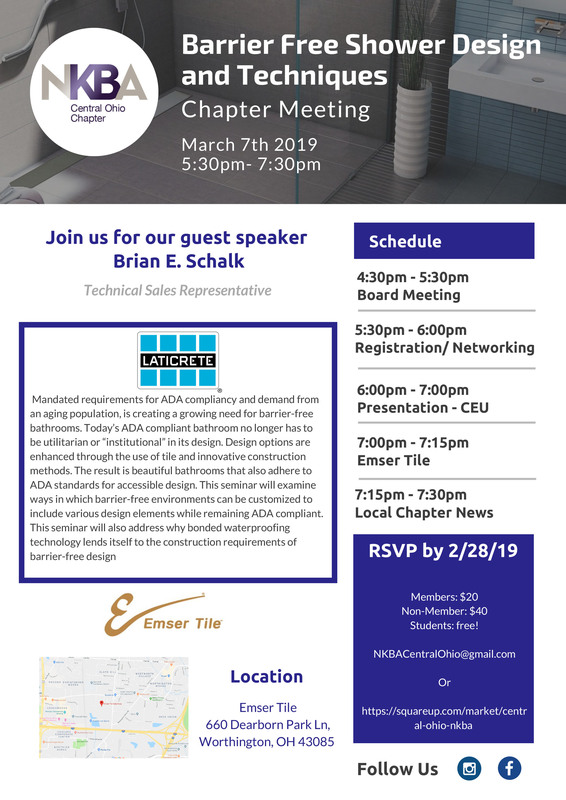 Join us and learn how this market trend can change up your design ideas! At this program you’ll learn how to create striking architectural photographs and increase your bottom line. Learn what will draw the viewer’s eye to what you want them to see. 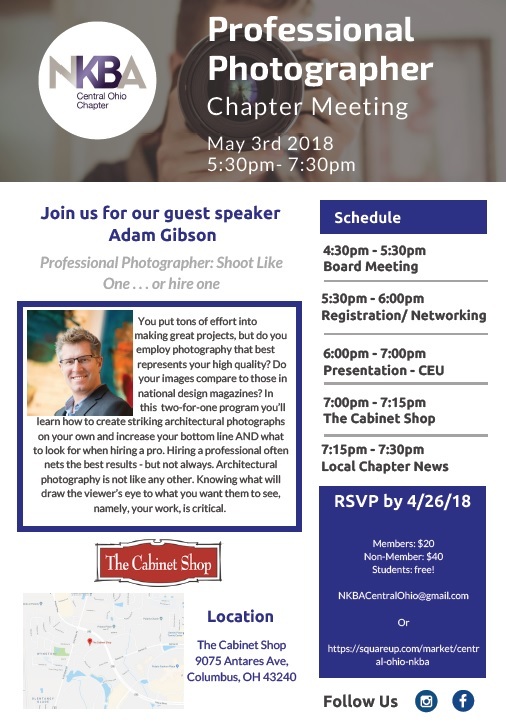 Join us for our 1 credit hour CEU event, as we learn about Professional Photography by Adam Gibson. without time to enjoy it what do you really have? Trivia Night – materials based on AKBD Certification Test. JINGLE & MINGLE at Central Ohio Chapter of NKBA’s Ugly Sweater & Bowling party! Have you ever spent hours with a person who has no intention of giving you any money? Whether you choose to charge a design retainer or not, most kitchen and bath dealers spend too much time, and give away too much knowledge, prior to receiving a commitment from the potential customer. We will discuss ways to quickly and accurately estimate a project and a professional way of discussing budget with a potential customer, without spending hours or even days of your valuable time. Learn unique ways of qualifying potential clients, without asking the typical qualifying questions. The Residential Color & Design Trends Guide for 2016 unveils four dynamic and essential directions in design trends. Our teams are continuously monitoring emerging trends for an overarching theme. This year, that theme is Odyssey which reveals a growing need for changes, newness, adaptation and discovery. These words are often challenging ones in home decor and residential design – an industry where the very idea of “change” is slower to materialize than it is in other design industries. Identify the overreaching societal trends driving your client’s desire for change. Uncover aspects of the color trends that will resonate with your client’s natural inclinations. Recognize color combinations that will be at the leading edge of trends providing lasting style. Gain color confidence knowing that the trends presented are based on cross disciplined global input. There are many benefits and innovations to steam bathing, from skin care to holistic health. Please join us for this informative presentation sponsored by Worly Plumbing Supply. You will leave understanding how to incorporate this beneficial product into your next bathroom design. Lunch will be provided. This is a great way to meet members and network in a brand new venue! 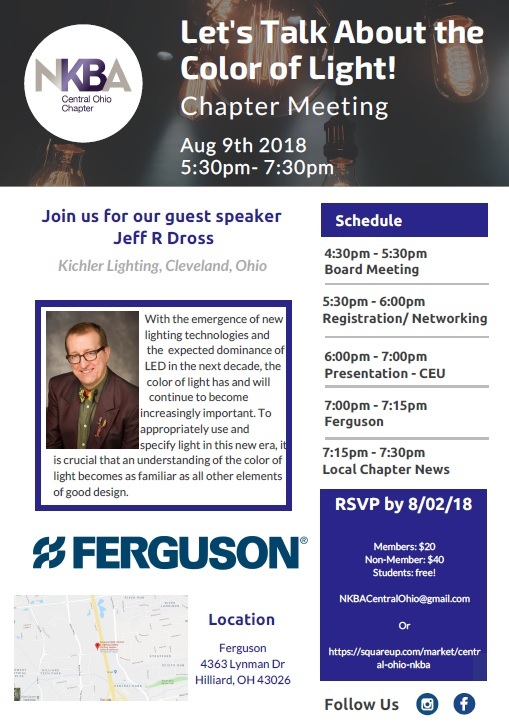 Bring your friends and learn more about your Central Ohio NKBA chapter. Your participation fee includes food and beverages! 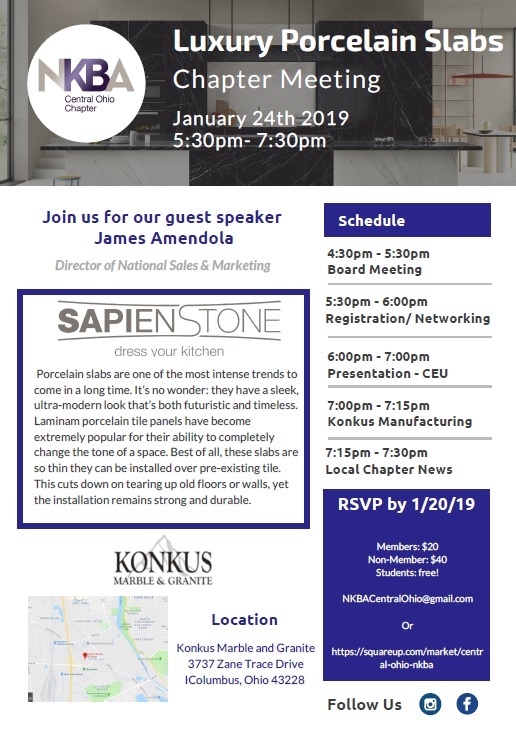 Jim Nowakowski will discuss how businesses today can better serve and reach their customers through the digital disruption in our current market place. You will gain a better understanding of the different tools available to keep your services relevant and of your own value in the scheme of business today. 3503 W. Dublin Granville Rd. 10,000 Baby Boomers are now turning 65 daily. Do you know the characteristics of this demographic and how to design for their aging needs? From the minuet you step in the door for this meeting, what you thought you knew about your world will begin to be challenged. A good designer needs to become grounded in understanding what happens to the body as we age and learn what happens in such diseases as Alzheimers. You will then begin to understand the how, when, why and where to specify particular products to meet this demographics’ needs. You will also begin to understand why Universal Design principles can only be used as a guideline, not a steadfast rule in this market segment. Susan will share some hilariously uplifting stories to make the topic fun, enjoyable, and engaging. Susan Benedict received her degree from Purdue University in Environmental Design in 1985. This past June marked her 30th anniversary of being involved in the kitchen and bath industry. James St. John is a geologist at the Newark branch of Ohio State University (OSU). He has been teaching there since 1998 but has also taught at OSU-Columbus and Otterbein College and Kent State University. James has numerous interests that include fossils, stratigraphy, caves, mining geology, meteorites, national parks geology, gemstones, the history of geology, and rare rocks. He first became interested in decorative stones in about 2005. His presentation will highlight the origin and geologic history of some of the most famous and glamorous varieties of commercially-available decorative stones.